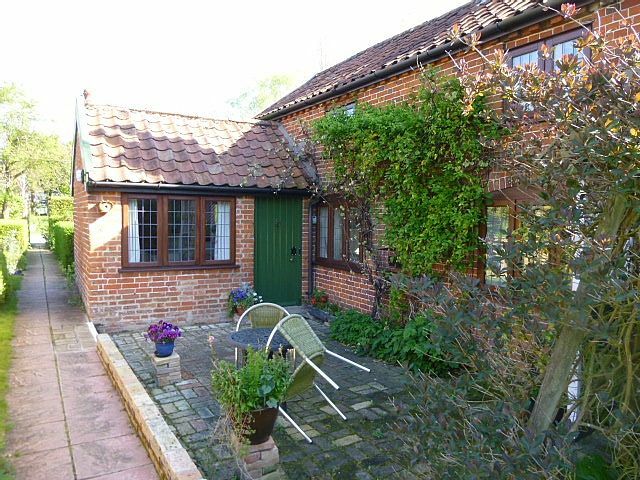 This charming red brick 18th century cottage is set in pretty gardens providing a quiet and peaceful retreat. There is a lovely patio with garden furniture and BBQ to be enjoyed. The sitting room with its traditional wood burner (all logs provided), exposed beams, and tasteful decoration create a cosy atmosphere. Quality soft furnishings provide a warm feeling giving the room the relaxed comfort and style of period living. It’s the ideal place to leave the troubles of the world behind you and simply enjoy the moment. The dining room with its double aspect and traditional quarry tile flooring provides a light and airy atmosphere. The kitchen is fully equipped with refrigerator, freezer, dishwasher, microwave, cafetiere etc. The fully furnished bedroom with exposed beams has a double bed. The upstairs bathroom has a bath with “shower over”. The cottage has full central heating and ample off road parking. Sorry, no smoking and no pets. Upstairs bathroom with bath/shower over and WC. The lounge with its wood burner (all logs provided) exposed beams, and tasteful decoration creates a cosy atmosphere. There is a TV and DVD player. The separate dining room with its double aspect and traditional quarry tiled floor is light and airy. The kitchen is well equipped with water softener, fridge, freezer, dishwasher, 4 plate hob, oven, microwave, slow cooker, cafetiere etc. Table with 2 chairs. Double aspect windows. Lovely patio area which overlooks a cottage garden. This area is bathed in evening sunshine. There are three pay and play golf courses within a 20 minute drive. Notes on accommodation: The cottage is set in the heart of the Suffolk countryside. Cycle route No. 1 winds its way down the quiet lane which passes the garden gate. It is in the tiny hamlet of Sibton Green, just outside Yoxford. Minsmere, Dunwich and North Warren Reserves are within easy reach, and the whole area is ideal for walking, cycling, bird watching and sailing. In addition to the local village shops in Yoxford, (including antique and art galleries) and Peasenhall (home of Emmetts the delicatessen featured in Rick Stien's TV programme), the local market town of Halesworth is only 4 miles away. Outside: There is a private patio with garden furniture and BBQ overlooking a shared garden. Private off road parking spaces. Cleaning / Towels / Linen / Maid service: Towels and Linen are provided for each guest and replenished for stays longer than a week. The cottage is thoroughly cleaned before each guest's arrival and then weekly for stays longer than a week (if requested). Mistletoe cottage is a real away from it all place. Set in the midst of countryside, it is peaceful and quiet but within easy reach of lots of places to visit. The cottage has everything. The log fire was a lovely addition to the central heating and the little dishwasher was just perfect. Gorgeous big towels & beautiful bed linen completed the careful preparation of the cottage. The owners were very nice and left tea, coffee & milk plus a bottle of wine for us. A lovely touch & very thoughtful. We would definitely stay at Mistletoe cottage again. Thank you for such a lovely review - we hope to see you again. Accommodation was exactly as shown in the photos. Shared pathway gives a clear view into gardens/2 cottages opposite but as our stay was out of season we hardly saw anyone. Mistletoe Cottage has a well kept patio and garden to the rear of the cottage is also well maintained. A pretty setting. Nice touch to have received a bottle of wine upon arrival as well as a carton of milk. Instructions for maintaining upkeep of cottage were easy to follow. Thank you for your review. We are pleased you enjoyed your stay. The cottage was delightful in every way. Immaculate/perfect - everything you could wish for. Great hosts too. Will definitely return. We are so pleased you enjoyed your stay, and thank you for your comments. We have been going to Mistletoe Cottage for the past five years for Christmas. Wonderful cottage, everything you need and more. Warm, comfortable, all facilities and a great price. Fab cottage, perfect location ! Recently spent 3 nights at Mistletoe Cottage with my husband. It was one of the most beautiful, comfortable, warm, attractive and well-equipped cottages we have ever stayed in. It was in the perfect location for lots of local bird-watching sites, being only a short distance from Minsmere and Dunwich. It might not be the best cottage for people over 6ft tall, but personally I loved this peaceful cottage with it's views over the fields....especially the "loo with a view". Well worth repeated stays and looking forward to visiting again. Steeped in natural beauty the Heritage Coastal towns of Aldburgh and Southwold are just a 20 minute drive. Slightly closer is the world famous Snape Malting concert hall with its international musical offerings and in particular its annual festival in June. Short Breaks are available all year except for the high season. Changeover Day: The change over day is flexible except during the high season when it is Saturday. Short breaks are welcome except during the high season.